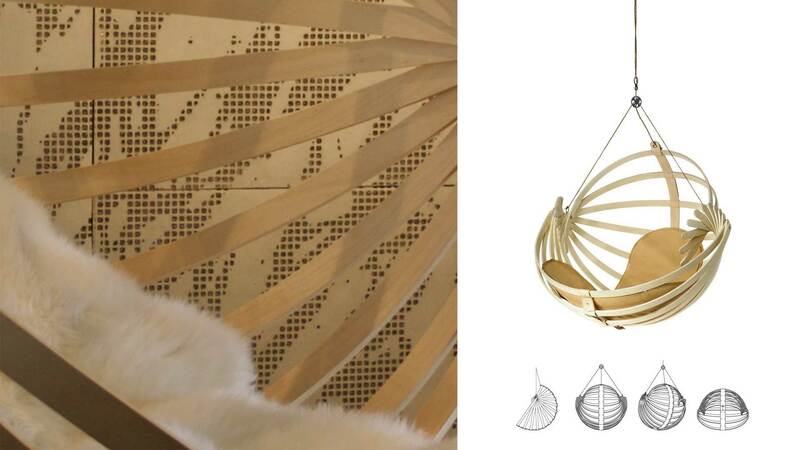 Jiella is a suspended wooden chair utilising spherical geometry. The structure consists of molded laminated battens cut from one laminate veneer sheet. The inner veneer layers are birch, while the surface is ash, walnut, oak or beech. The molded laminated parts are pulled together at the ends of the battens by means of steel shafts from which the chair can be suspended. The airy geometry is based on easy assembly and packing: the curved wooden elements can be interlapped to make a flat package. Jiella is delivered to the client in a package including the wooden parts, a leather cushion, hanging equipment and simple assembly instructions.